As a mayoral candidate, Snively had promised to restore some of the citizen boards that were eliminated by the 1913 city charter. Soon after taking office he created a nonsalaried park board, made up of citizens representing all sections of the city. Snively’s new board had no real power. Its role was to advise the mayor on “all matters pertaining to parks, driveways, and other projects tending to beautify the city.” Snively appointed eleven people to his advisory park board. Mina Merrill Prindle, donor of the Janette Pollay Park land, became a member of Snively’s advisory board, along with Mrs. W. J. Olcott, Mrs. C. R. Keyes, and Mrs. John Millen. These women were soon called on to offer suggestions for the Girl Scouts’ beautification program. The scouts adopted Janette Pollay Park as their hiking base and made plans to construct a shelter for overnight stays. In recognition of their good stewardship, in September 1925 Mina Prindle gave the Girl Scouts ownership of fifteen acres of land in the middle of the park. As she had before, Mrs. Prindle made this donation in memory of her mother, Janette Pollay, and requested that the Girl Scout camp be known by that name. The scouts built their rustic cabin on a high bank overlooking Amity Creek. They opened the building for public inspection on August 21, 1926, and the next day officially dedicated it as the Janette Pollay Cabin. A portrait of Janette Pollay in her lavender silk wedding dress was hung in the cabin’s main room. In 1929 local Girl Scouts helped plant over 4,500 trees within the park to help replace those lost in the 1918 Cloquet Fire. 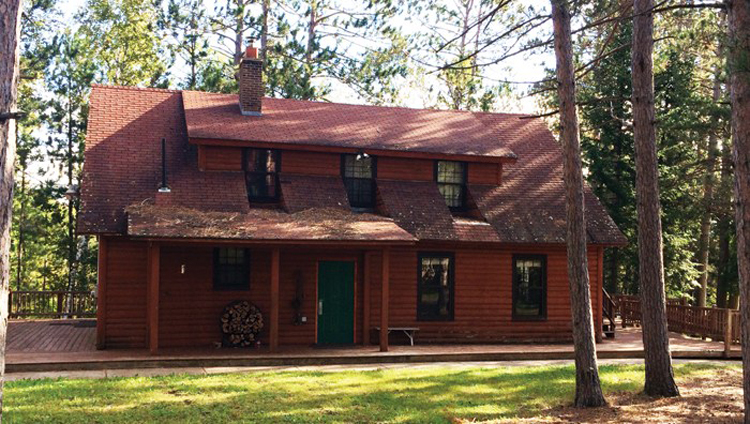 The cabin, now called the Janette Pollay Cabin and Outdoor Program Center, still serves area Girl Scouts today. The building itself is used for meetings, crafts, games, and overnight stays—it can sleep up to twenty-four campers. More amenities surround the cabin, including a large fire pit, a picnic shelter with rustic fireplace, a playing field, and six campsites. Story by Nancy Nelson. Originally published on Zenith City Online (2012–2017). Click here for more stories by Nancy Nelson.